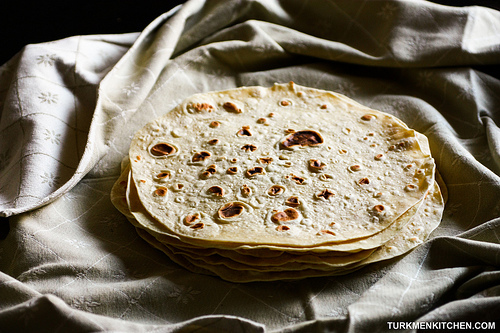 Gyzzyrma is a thin Turkmen flatbread that is traditionally eaten by tearing off a piece and scooping up jigirdek or gowurdak. These flatbreads are quick and easy to make, and they are best eaten straight off the pan. You can also use these for kebab wraps or simply eat them spread with butter and jam. In a large bowl, mix all the ingredients together and knead in the bowl until a soft dough forms. Divide the dough into 8 pieces and roll each piece between your palms into a ball. Cover the balls with a kitchen towel and allow to rest for 5 minutes. Heat a medium pan over medium heat. Take one ball of dough and, on a lightly floured surface, roll it out to a 22 cm circle. Place the flatbread in the hot pan and cook, flipping once, until browned in spots on both sides. While one flatbread is cooking, roll out the next one. Wrap the flatbread in a large kitchen towel to keep soft and warm while you cook the remaining flatbreads.